Spectacular investment opportunity in north Monrovia only four blocks from Old Town Monrovia. This property is centrally located in the San Gabriel Valley just minutes north of the 210 Freeway with easy access to the 605 Freeway while only 15 minutes from Pasadena. Quality built 1951 traditional style home in a desirable north Monrovia neighborhood. This charming home offers generously proportioned rooms; including a living room and dining room with a wood burning fireplace, original kitchen with breakfast nook and two bedrooms. Ideally situated in one of Monrovia’s desirable neighborhoods this 1895 Victorian home has recently undergone a detailed restoration that maintains the original charm and character of the home while providing all of the upgrades currently expected in quality homes toady. Located on the corner of Primrose and Walnut this spectacular investment opportunity is only 1 block from the movie theaters, coffee houses and farmers market in Old Town Monrovia. Character filled 1911 Craftsman bungalow ideally located on a corner lot in Monrovia’s Wild Rose Tract Historic District. This well maintained home is an entertainer’s delight featuring Mahogany woodwork throughout including built-in bookcases, a built-in hutch in the living room, beamed ceilings and a built-in china cabinet in the large dining room. Stunning Mediterranean style home ideally located in north Monrovia just north of Hillcrest Ave. Built in 1925 this two story home has undergone a detailed restoration that maintains the original charm and character of the home while providing all of the upgrades currently expected in quality homes today. 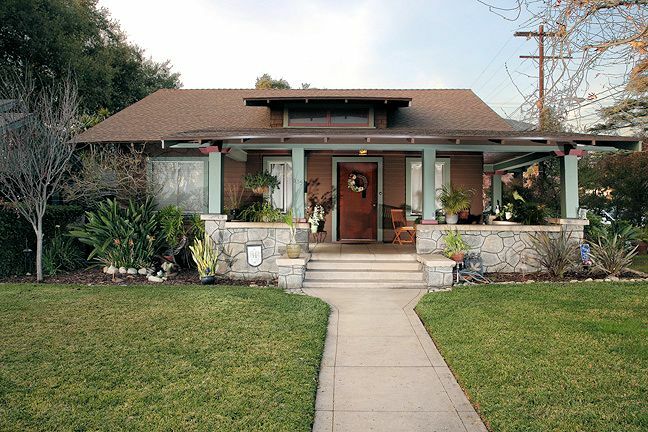 Charming bungalow home built in 1922 located in north Monrovia. This 2 bedroom, 1 bath home has a modern open floor plan featuring a kitchen with a custom made cabinetry and a breakfast bar opening into the family room. This large 3 bedroom 2 and 1/2 bath Townhouse is well located in the Old town area of Monrovia. Only a one block walk to the movie theaters, coffee houses and the farmers market and only a 15 minute drive to Old Town Pasadena. The residence features a kitchen with oven, range, dishwasher and refrigerator. Welcome to this charming traditional style home with a desirable open floor plan which is perfect for entertaining as guests move from the large living room with fireplace to the oversized covered backyard patio. Food preparation will be a breeze in the updated kitchen with stainless steel appliances. Contemporary, stylish home completely remodeled and upgraded. Featuring 2 large bedrooms each with its own full bath upstairs and 1/2 guest bath downstairs. Upgrades includes granite counter tops, sleek lighting, and classy fixtures throughout. Located in one of Monrovia’s most sought after neighborhoods, this charming north Monrovia home is ideally situated on a large lot. The mid century 2 bedroom 1 and 3/4 bath home was built in 1949. In the late 1800’s young and well to, Joseph Sartori built this house for his new bride Margaret. He was Monrovia’s first Treasure, went on to establish Security Pacific Bank and was instrumental in the development of UCLA. Joseph gave to the community generously and was a respected leader. You’ll find elegance and style in this 4 bedroom, 3 bath, 20th century charmer situated in one of the finest neighborhoods in north Monrovia. This is a beautiful 4 bedroom, 1 3/4 bath contemporary home. There are hardwood floors in the living room and dining area as well as a wood-burning fireplace. The entire floor plan is perfect for entertaining and the home has central heat and air conditioning. Four residential unit apartment building that is just a two minute walk to popular old town Monrovia. This is an exceptional bright and sunny home north of Foothill. There is a west facing Living room with fireplace, the interior is newly painted and most rooms have refinished hardwood floors. The unique property has two detached homes and is located 3 blocks north of Foothill Blvd. in one of Monrovia’s finest neighborhoods. The property has two detached homes and is located in one of Monrovia’s finest neighborhoods. These homes are conveniently located near shopping, parks, transportation and the freeway. This one of a kind property offers a rustic, mountain atmosphere on a large lot that is over 14,800 square feet nestled near the Gold Hills in of Monrovia’s finest neighborhoods. This 1924 Spanish Revival Classic is located in North Monrovia, one of the cities most desirable neighborhoods.